Long time no first impression post. I miss doing this type of post because I know it could help others decide to invest. A good investment should be well-researched from advantages to disadvantages, ins and outs, etc. 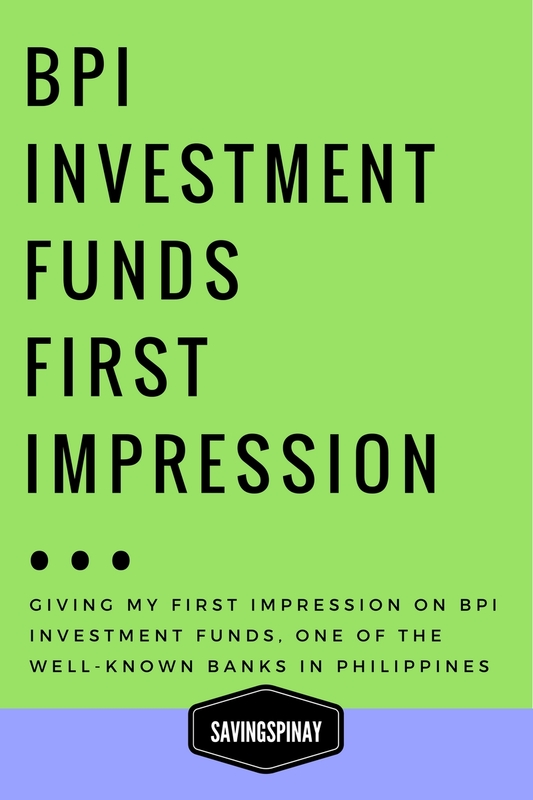 In today's post I will be giving my first impression on BPI Investment Funds. BPI is a very common bank here in the Philippines and has been my bank of choice for so long. There are different kinds of investment vehicle one can invest with. The list includes traditional investment vehicles like savings deposit, time deposit, treasury bills, etc. There are also non-traditional kinds like real estate and jewelries. BPI Investment Funds fall in the traditional investment vehicle category for it consists of several Unit Investment Trust Funds (UITFs) that are managed by BPI Asset Management. How to Invest Your 5,000 Pesos - New! Unit Investment Trust Fund (UITF) is a type of investment wherein your investments are handled with the bank instead of private financial institution just like mutual fund. The funds from clients of similar investment objectives are pooled together into one fund and aims to give maximum possible returns. 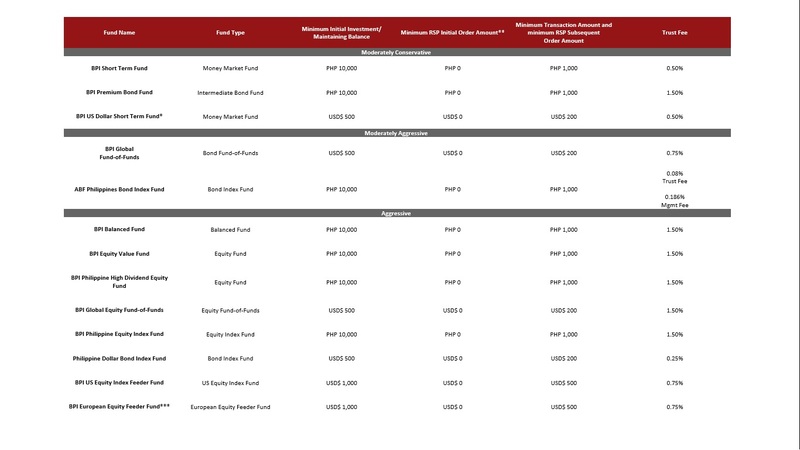 How BPI Investment Funds work? BPI Investment Funds includes a wide range of investment products. Each fund seek to offer potential higher returns that a regular savings account provide. There is a fund for a particular investor personality that I'll be discussing on the later part of the post. What is BPI Asset Management? BPI Asset Management manages all funds under BPI Investment Funds. They manage the assets of both institutional and individual investors through innovative investment products and solutions. The goal of BPI Asset Management is to deliver above high return possibility over its client's investment horizon. BPI Asset Management is regulated by Bangko Sentral ng Pilipinas (BSP). For more information CLICK HERE. BPI Short-Term Fund - a money market unit investment trust fund being offered for investors will small capital. You can start the fund wth 10,000 pesos initial investment and can add-up a minimum of 1,000 pesos per transaction. ABF Philippines Bond Index Fund - is a peso bond fund that seeks to achieve its investment return that closely track the total return of the iBOZZ ABF Philippines Index 1-10 years index. The fund is primarily invested in peso denominated eligible sovereign and quasi-sovereign bonds. Benefits of BPI Investment Funds? Access your investment funds on any BPI branches nationwide or via internet through BPI ExpressOnline. Also you are not limited to your branch of account for your investment transactions. You can subscribe to or redeem from any branch or online. Invest anytime as your subscription and/or redemption are received anytime within the banking hours. Easily Enroll your fund in the Regular Subscription Plan. This is an investment program that allows you to nominate a regular subscription amount for purchase units on a periodic basis either monthly or quarterly. This is advantageous if you want to be consistent with your investments and you won't need to visit a BPI branch anymore. The additional investment to BPI Investment Fund you are enroll with will be automatic. How to Open a BPI Investment Fund? 1. Opening a BPI Investment Fund is easy. All you need to do is download, read and fill up the Account Opening Form. It is an 8-page PDF document that includes Investment Account Application, Client Sustainability Assessment, Participating Trust Agreement and Risk Disclosure Statement. 2. The form must be printed, filled out and signed. 3. The documents will be submitted to any preferred BPI branch. BPI has long been a top choice when it comes to bank in the Philippines. They are very respected when it comes to banking and finance. I opened a BPI Express Online Savings Account as well as BPI Direct Save Up + Insurance Savings Account through BPI and I am one happy customer. I love that they've made banking very convenient with a lot of branches here and there plus the online banking through BPI Express Online. BPI Asset Management is the leading investment manager for many of the top individuals and institutions in the country. It has proven and unbeatable track record with 24/7 online financial reporting system. You can trust that your money and your investments are taken care of. If you'll search on the Top 10 Best Performing Mutual Fund you'll surely bump to not just one but two or more investment products from the BPI Investment Funds. This goes to show that the asset managers are doing well in their job of providing the best possible returns for its investors. BPI Investment Fund's initial investment starts at 10,000pesos unlike FAMI Mutual Fund. BPI Investment Funds offer variety for the public. They have various kinds of investment products for anyone's investment goal, starting capital and investment horizon. A BPI bank can be found almost anywhere so it is definitely easy to coordinate with bank manager and open an account. My Pampanga 2D+1N Itinerary and Expenses - New! 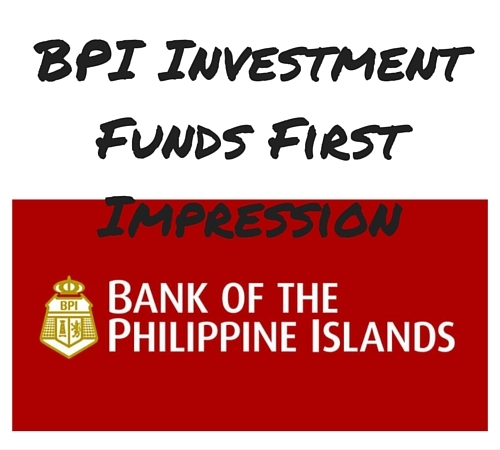 3 comments on "BPI Investment Funds First Impression"
Your welcome Jacqueline! Thank you for supporting SavingsPinay!